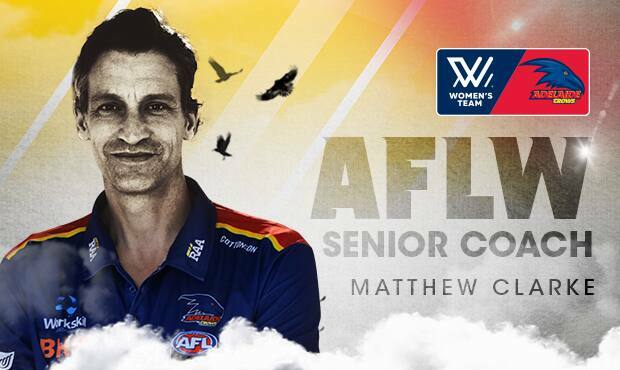 The Adelaide Football Club is delighted to announce the appointment of Matthew Clarke as Senior Coach of its AFL Women’s team. Currently an Assistant Coach with the Club’s AFL side, Clarke brings significant coaching and playing experience to the role. Recognised as one of the best tap ruckmen of his time, Clarke’s AFL career spanned four clubs and a total of 258 games between 1993 and 2007. He represented the Crows in 118 games and four finals series. After finishing his playing career, coaching came as a natural evolution for Clarke and he has served as the Crows’ AFL Assistant Coach – Ruck since 2008. The 44-year-old, who is also a qualified veterinarian, will be responsible for all facets of coaching, player development, leadership and strategic planning for the Club’s AFLW program. Crows Head of Football Brett Burton said the Club was confident Clarke would excel in the role. “Matt has been a part of the coaching team at the Crows for the past 10 years and has a strong understanding of our AFLW program as well as what we stand for across the Club more broadly,” Burton said. “While his football experience is obviously impressive, Matt also has a brilliant strategic mind and brings a strong focus on personal development and culture which is important. “As a Club, we went through a thorough process to get the best person for this role and Matt brings a wealth of experience and qualities which we feel will strengthen our women’s program. Clarke said he was thrilled to be appointed to the role and to continue his football career with the Crows. “It’s an honour to be appointed as Senior Coach of the Crows AFLW team,” Clarke said. “During the past two years I’ve watched the formation of our team and admired the commitment and passion they have demonstrated. To now be fully involved in the program is something I’m very much looking forward to. Clarke will commence in the role immediately with the sign and trade period for AFLW clubs starting today, Wednesday, May 23 and running until Monday, June 4. He will have a dual role, continuing as Ruck Coach for the Club’s AFL team during the AFLW off-season. The Crows AFLW team is in partnership with AFLNT, with players based in Adelaide and Darwin. The League is yet to determine the format of next year’s competition, which will increase to 10 teams with the addition of Geelong and North Melbourne. Recognised as one of the best tap ruckmen of his time, Clarke’s playing career spanned 258 games across three Clubs – Brisbane, Adelaide and St Kilda. A journeyman as a player, Clarke was first drafted and delisted by Richmond without playing a senior game, before making his AFL debut with Brisbane as a lanky 19-year-old in 1993. After 130 games, a Best and Fairest and two runners-up placings, Clarke was picked up by Adelaide ahead of the 2000 season where he played 118 games before winding up his career at St Kilda in 2007. Coaching came as a natural evolution for Clarke and he has served as the Crows’ AFL Assistant Coach – Ruck since 2008.